Sigmund Spaeth : First Lessons in Surf Bathing, 1912. Sigmund Spaeth: First Lessons in Surf Bathing. J.B. Lippincott and Co., Philadelphia, July-December 1912. 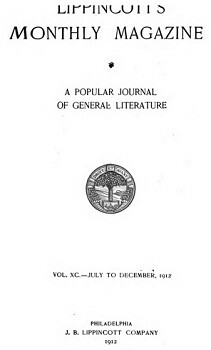 Charlotte Medical Journal, 1914 (?). Rather than an introduction to surf-bathing technique, as implied by the title, Spaeth presents a humorous guide to surf-side "courting" from a male and a female perspective. Sigmund Spaeth wrote an earlier article Flavia Swims in Lippincott’s, volume 88, September 1911, page 382. Spaeth was an American musicologist who traced the sources and origins of popular songs to their folk and classical roots. Presenting his findings through books, lectures, liner notes, newspapers, radio and television, he became known as The Tune Detective. The Importance of Music and Stories Behind the World's Greatest Music. It is not only dangerous, but unprofitable. An audience is almost essential to successful surf-bathing. A feminine companion will be found most satisfactory. If you are possessed of an Apollo-like figure, that fact will be most impressive when you are in a bathing-suit. If your contour is not fit for public presentation, the friendly waves will hide your shortcomings. There are two ways of entering the water. One is to lead your fair companion daintily, a step at a time, into the fearsomely inviting depths, helping her over every inch of foam which might be called a "breaker." Answer her shivers and gurgles of delight with superior smiles, toss the water aside contemptuously with knees and shoulders; in short, adopt the attitude of "man, the protector of femininity." The other method of entrance is more violent, and in some ways more effective. Leave your companion on the beach with the explanation that you "must get wet first." Then run at top speed into the water, leaping over the billows like a frightened deer, and finally plunging forward on your stomach, with every appearance of complete fearlessness. She will admire your agility, your strength, and your courage. Return, smiling and nonchalant, with some such conventional expression as, "Isn't it glorious?" After this the actions of the first method may be repeated. If the lady is of the athletic type, however, she may prefer to be dragged swiftly through the water, even to be ducked and roughly handled, to show what a jolly good fellow she is. After getting into the surf the greatest difficulties are encountered. Do not laugh immoderately at any of the lady's jokes. A mouthful of salt water will be your reward. Stand facing your partner, grasping her elbows, while she grasps yours. A slow and solemn dance may then be begun, to which the ocean will be found to supply a fairly good rhythm. As you bounce up and down, you may utter such polite ejaculations as "Heavenly! Divine! Oh, rapture! Oh, bliss!" Your companion will perceive the ambiguity of your remarks and blush prettily. If a particularly large breaker comes rolling in, lift your companion [Page 234] high in the air, at the same time allowing the water to pass completely over your head. This is always considered an act of particular heroism. The slight discomfort attending it is more than balanced by the admiration and sympathy you will enjoy. If the lady accidentally lands upon your foot and notices the look of pain in your countenance, pass it off with a jest about "the undertoe." You will find that very little more is needed in the way of conversation. Always rest upon the beach at least two hours before entering the water. By that time you will have a ring of admirers large enough to give you a wide choice in the matter of a bathing companion. Select the brownest, handsomest, and most athletic of the men, making sure that his bathing-suit harmonizes well with your own. Walk slowly with him to the water's edge, giving all the observers enough time for admiring comment. On first wetting your feet, gasp slightly or emit a melodious scream, at the same time clutching your partner's hands tightly. He will assume a protecting air, mingled with frank adoration. Cling to him more and more as the water grows deeper. By this time he will be your willing slave. At the first really high breaker, throw both arms around his neck and half strangle him in your embrace. The more you maul him, the greater will be his ecstasy. If he succeeds in getting you into the quieter water beyond the breakers, at once suggest to him that you would like to learn to float. He will teach you with alacrity. Sink slowly and carefully back into his arms, reclining in a graceful position. He will hold you safely and tenderly, never realizing that his support is quite unnecessary. After about fifteen minutes of this you will be ready for a continuation of the more violent embraces of the breaker-jumping. On coming out of the water, hurry home as quickly as possible. It is unhealthy to stand around in a wet bathing-suit. Moreover, the woman has not yet been created who can make a good impression when she looks like a drowned rat. Your period of exhilaration is over for the day. Geoff Cater (2016) : Sigmund Spaeth : First Lessons in Surf Bathing, 1912.